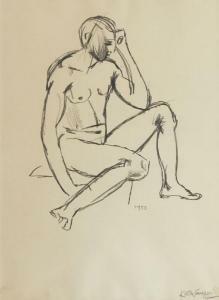 Find artworks, auction results, sale prices and pictures of Keith Vaughan at auctions worldwide. Keith Vaughan (1912-1977) Landscape with Two Figures signed 'Keith Vaughan' (lower right) and inscribed and dated 'Landscape with 2 Figures 1969' (on the artist's label attached to the backboard) pencil, gouache and coloured crayon on paper 5 ¾ x 4 ½ in. (14.6 x 11.4 cm.) Executed in 1969. Provenance with Tib Lane Gallery, Manchester, 1985, where purchased Mr and Mrs Maurice Wade, and by descent. § Keith Vaughan (British, 1912-1977) Grey Shore Seascape, 1950 oil on hessian laid on board 25 x 34cm (10 x 13in) Literature: Anthony Hepworth and Ian Massey, 'Keith Vaughan, The Mature Oils 1946-1977', Sansom & Company, Bristol, 2012, p. 64, cat.no.AH89 (This catalogue entry states that the painting is signed 'Vaughan') Philip Vann and Gerard Hastings, 'Keith Vaughan', Lund Humphries in association with Osborne Samuel, Surrey, 2012, p.45, ill.39 Other Notes: On the 6th February 1940, Vaughan wrote in his journal: 'There was a mill built against a side water of the creek with a stream piling up against a lock and bursting through into the afternoon. Men loaded something into a large barge, hurriedly…The tide was out, the water had drained off the mud into the single ribbons. It was indescribable as taste, the soft and subtle modulations of colour, amorphous grey mud and red iron and the roots of wood and stumps of broken brickwork and concrete, the hulks of boats with their tarred backs and the sun bleaching and rotting the paintwork'. (Taken from Philip Vann and Gerard Hastings, 'Keith Vaughan', Lund Humphries in association with Osborne Samuel, Surrey, 2012, pp.44-45). The spot mentioned in Vaughan's journal was near to Pagham, West Sussex, where Vaughan's friend and lover, Harold Colebrook's aunt, owned a converted railway carriage. They would spend holidays there between 1935 and 1939, often accompanied by friends. 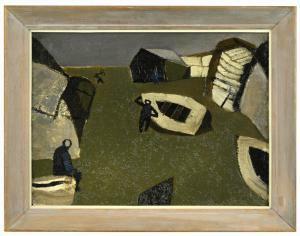 The image must have had a profound impact on Vaughan as he produced numerous paintings of the subject including 'Fishermen and Bathers' (1951), (private collection) and 'Grey Shore with Boat' (Bonhams, London, June 13 2008, lot 4). The gritty appearance of the beach appears to have been achieved by the artist mixing material into the paint, probably sand. At the lower left corner there is a diagonal scratch running through the seated figure. Under ultraviolet light this area appears very dark, suggesting it has been retouched. The area of the beach has been repainted, this appears to cover a lighter green colour which has been varnished. It seems likely that the reworking has been carried out by the artist rather than a later restoration, the legs of the small figure in front of a building at the top of the work appears to be applied over the top. There is also a very minor incision to the board in the top left corner. Keith Vaughan (British, 1912-1977) Abstract Landscape stamped with studio stamp 'K.V.' (lower right) gouache, ink and oil pastel 40 x 33cm (15 3/4 x 13in). Executed circa 1973-4 Footnotes Provenance Acquired by the family of the present owner, and thence by descent Private Collection, U.K. This late gouache was executed around 1973/74, when Vaughan was living and working for much of the time at his Harrow Hill cottage in Essex. At first glance it appears to be an abstract image, but on closer consideration we are able to make out the dark vertical bough of a tree, green and black hedges and undergrowth, the dark green sloping roof of a barn and, perhaps, a blue window. Throughout his career Vaughan had tried to achieve this synthesis between abstraction and figuration and many passages in his journal and studio notebooks discusses his objectives. 'Imagination is based always on observation; it is a summary of the evidence of the senses, intensified in the memory and carried forward one stage into the future where it stands as a revelation of the truth not yet achieved by the slower process of nature...the point of value lies in whether our own experience is enlarged by the distortion.' (Keith Vaughan quoted in Gerard Hastings, Paradise Lost and Found: Keith Vaughan in Essex, Pagham Press, 2016, p.45) We are grateful to Gerard Hastings, whose new book on Keith Vaughan's graphic art will be published by Pagham Press later in the year, for compiling this catalogue entry. 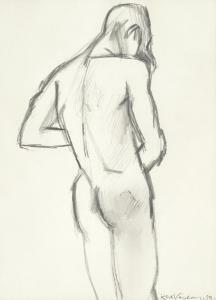 Keith Vaughan (British, 1912-1977) Figure from Behind signed and dated 'Keith Vaughan, 59.' (lower right) pencil 24 x 17.5cm (9 7/16 x 6 7/8in). 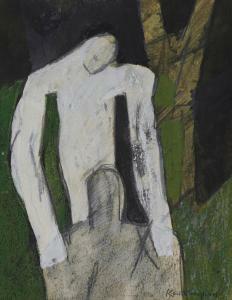 Footnotes In 1959 Vaughan produced several paintings of single figures viewed from behind (see Bather, 1958/9 and Bather, 1959). This sensitive study, carefully observed and drawn from life, is one of many that were made as anatomical studies either in the life room at the Slade, or at Hampstead Ponds. During the 1950s drawing had become an essential ingredient in his creative life. Whenever painting proved difficult, Vaughan turned to pencil and paper and the figure drawings of this period are among some of his finest. We are grateful to Gerard Hastings, whose forthcoming study on the book illustrations and graphic art of Keith Vaughan will be published next year, for compiling this catalogue entry.